These finger food ideas are so much fun because your guests are the chefs! On this page you will discover how to set-up an appetizer bar. 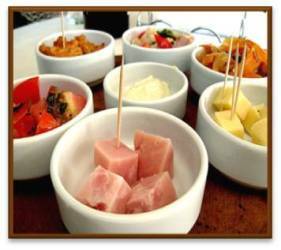 An appetizer bar is just like an omelet or salad bar, except it is a finger food extravaganza! Your guests' fingers will be all over this one. You provide the breads, crackers, cheeses, meats and veggies and your guests do all the work as they create their own unique appetizer combinations. 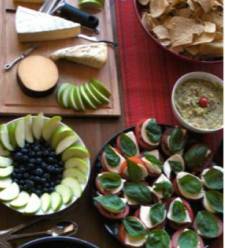 How about an appetizer bar potluck! To set-up an appetizer bar start with a table or counter top. It's probably best to have everything placed on one table or counter, so guests don't have to hunt down the goodies. 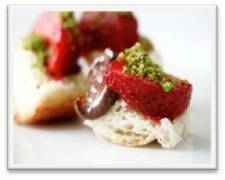 Each guest will then construct their favorite flavor combinations from a selection of breads, spreads and toppings. The foundation of all appetizers is the bottom layer, which can be any bread or cracker. Position these at the head of the buffet table along with toothpicks, skewers, mini-pitch-forks, forks, spoons, plates and napkins. At the end of the table place the toppings. These morsels will the crowning flavor glory of your finger food creations. Keep in mind that some spreads can double as toppings.